That's how many miles I logged training last week which is by far the most I have ever done in a week that didn't include running an ultra. In my younger days I was never a high mileage trainer and never went over about 1,600 miles in one or two years. During one 7 week stretch in 1982 I averaged just a little over 50 miles per week before cutting back. Then when I began my ultra career in 2002,I was only running about 20 miles a week. When I really got into it in 2003 I bumped that all the way up to 25 miles a week before my 1st 50 miler and then in 2004 I was all the way up to a whopping 29 miles a week. 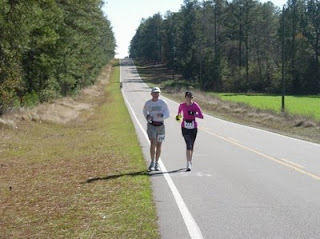 Over the next few years I got up to around 42 miles per week until the injury riddled 2008. After taking the time off at the end of last year and beginning to re-build this year I have done a lot of thinking about what I hope to accomplish over the next few years. First I needed to rest my mind and body and then I could start the process. What I now have planned is to concentrate more on training and hopefully training smarter while racing less often over the next couple of years. I feel that I never realized my full potential as a runner over the past years and now I want to try and see what I have left in this aging body. I will be trying to build up to the highest training volume I've ever done while still incorporating the tempo runs and track work into my schedule. Consistency will be of key importance as well as allowing rest and recovery periods in the building process. Over the next two years I will mainly concentrate on the marathon with the occasional shorter Ultra and I believe I can set new personal best at every distance from the half-marathon up and by the end of the next two years also set a new 100 mile pr. Will it be easy? NO ! And I fully realize the challenge of taking on such a goal at age 54. But I also know that the reality of age and time will soon prevent me from improving anymore despite my training. That is why I am making the effort now. I hope you will enjoy the trip with me.